Private equity firm SAIF Partners and angel investors like MakeMyTrip founder Deep Kalra have invested $5.5 million in ZOVI.com, the first exclusively online clothing brand in India. Kalra has also joined the board of the company. ZOVI will use these funds to expand its supply chain, inventory and product range. The firm has been founded by Cleartrip's former senior vice-president (Technology) Satish Mani. 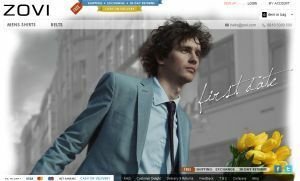 ZOVI.com's senior management includes Kavindra Mishra and Sartaj Mehta, both from Benetton India. ZOVI has initially launched the venture with men's formal shirts and belts, and plans to expand across men's and women's categories in the coming months. ZOVI merchandise is only sold online, thus replacing the offline distribution model. "Given our experience with VANCL.com in China, we have a very high conviction on this business model," said Ravi Adusumalli, Managing Partner of SAIF Partners. The firm has backed Chinese online clothing retailer Vancl.com, which is reportedly planning to raise $1 billion in a US IPO. The firm had raised its recent round of funding in December, 2010, at a valuation of $1 billion. According to Technopark 2010 report 'India's Consumer and Retail Sectors,' apparel is the third largest category in discretionary spending. As disposable income increases, consumers spend more on apparel and other lifestyle-related categories. In the Indian organised retail sector, apparel is the largest category comprising around 30 per cent of the market share. "We are excited to have such a unique complementary skill set of technology and fashion within the core team. The team has done a fantastic job, building a world class product offering over the past few months," said SAIF's Adusumalli. "E-commerce is growing rapidly in India. Increasing Internet penetration, compelling value and convenience are driving urban consumers toward online transactions," said Mukul Singhal, vice-president, SAIF Partners. SAIF, which currently manages $4 billion across funds, also includes MakeMyTrip, HomeShop18, Inkfruit and FirstCry in its Indian e-commerce portfolio. Having tasted success with online investments with companies like MakeMyTrip and JustDial, the investment firm has been betting aggressively on this sector. SAIF has also backed companies like Speciality Restaurant, Network18, TV9 and the National Stock Exchange.